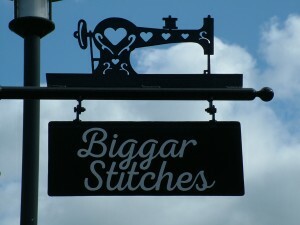 Hello, I’m Kim and Biggar Stitches is my business. I’ve been sewing since I was at school in the eighties. I started out by making clothes for myself and for others to include wedding, bridesmaid and christening dresses, and also curtains and cushions. I was introduced to quilting and patch working in 2008 when recovering from a life-changing operation. It was at that point that starting a quilting and sewing business became a dream, and that dream became a reality at the end of 2014 when I was made redundant from the banking industry. I live just outside the fantastic little town of Biggar in South Lanarkshire in Scotland – check it out on a map – we’re only about 25 miles from Edinburgh and about the same distance from Glasgow. You’ve probably already worked out that I named my company after the town as I think Biggar Stitches has a certain catchiness to it don’t you think. I initially started the business as an online shop, having turned a large spare room in my cottage into a quilter’s haven – just imagine being surrounded by shelves of fabric bolts, two 6-foot tall double-sided display stands of rulers, templates, rotary cutters, scissors and all sorts of notions. I thought that opening an actual shop in the town would have been way off into the future, however an opportunity knocked and on Saturday 11 July 2015 I opened the shop doors to customers. I’m not a natural blogger nor would you usually hear from me through the various social media. My natural style is to do the listening and reading of others. However, that’s all changed as I feel that I’ve got so much to share with you all such as interesting information and websites; sharing a link to the latest tutorial of my favourite quilting teachers; sharing my love (or even a dislike on the rare occasion) of a product or fabric; telling you about new fabrics that I’ve ordered and when they’ve arrived for you to buy; and new techniques or templates I’ve tried for the first time. I hope you’re picking up my enthusiasm and excitement already! I’m so lucky to have very supportive family and friends in my life. To those of you – and you’ll know who you are – who stood still or sat long enough to hear me going on about starting my own business, well this is it – I’ve actually done it. Thank you for your support and encouragement – I love you all. Lastly, I might mention a couple of names more often than others so let me do a quick introduction – Darcy is my husband (and also my roadie when I have to pack up a van to take Biggar Stitches to quilt shows) and Bridget is my mum (who also quilts and is my volunteer assistant at the shows and you’ll sometimes see her in the shop). So that’s about it on us. Grab a cuppa, sit back and start browsing our website and select a new template and some fab fabrics for your next quilting project. Or better still, come and see us in the shop where your fingertips will just want to glide across the fabric bolts. A big quilting hug from me to you….